Congratulations to Brian, who came in with a correct answer later last night for a Place-of-Mystery win! 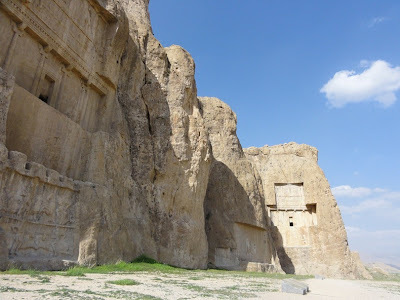 He correctly identified the mystery location as Naqsh-e Rustam in modern day Iran. There are many places in this world that I think are fascinating, even if somewhat "off limits" due to the current state of geopolitical affairs. Iran is one such fascinating country with a long and rich history. Some of you may remember the stories of Daniel and the Lions or Queen Esther from the Bible. All those happened in Ancient Persia which is modern day Iran. 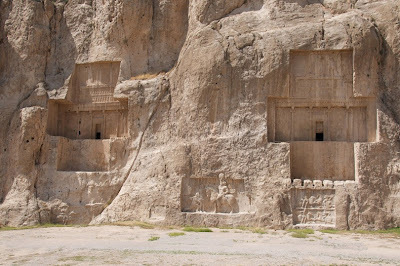 Naqsh-e Rustam are the rock-hewn tombs of the Persian kings from these very stories. There is King Darius (from the Lions' Den), King Xerxes (from Queen Esther and also the Battle of Thermopylae), and Artaxerxes (from the books of Ezra and Nehemiah). There are actually eight tombs here, but some of the rulers are lesser knowns. The tombs resemble the Royal Persian Palace at Persepolis and although grand, were looted by the army of Alexander the Great during his conquests. 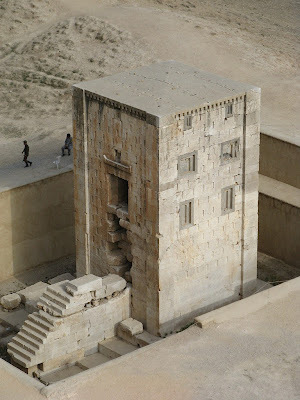 Oh, and that little box-like building in front of the tombs is called the Ka'ba-ye Zartosht. It was probably wrongly assumed to be a Zoroastrian shrine, but is most likely a much earlier tomb or some kind of reliquary. Fascinating, Nate! I'd guessed but then given up on a) the tomb of Cyrus the Great and b) the Behistun Rock. May have to try and figure out how far off I was, as the crow flies. Good job, Brian. Haven't I seen your name in the Winner's Circle quite often? Very interesting about Daniel & Esther (who is dear to me because I had a student named Hadessah once). Very impressive structures, I hadn't seen these before. Teheran must be a beautiful city as well, it is sad it cannot be visited easily by Westerners.